Extensive coverage of performance learning, including the Widrow-Hoff rule, backpropagation and several enhancements of backpropagation, such as the conjugate gradient and Levenberg-Marquardt variations. Both feedforward network (including multilayer and radial basis networks) and recurrent network training are covered in detail. The text also covers Bayesian regularization and early stopping training methods, which ensure network generalization ability. Associative and competitive networks, including feature maps and learning vector quantization, are explained with simple building blocks. A chapter of practical training tips for function approximation, pattern recognition, clustering and prediction applications is included, along with five chapters presenting detailed real-world case studies. Detailed examples, numerous solved problems and comprehensive demonstration software. Optional exercises incorporating the use of MATLAB are built into each chapter, and a set of Neural Network Design Demonstrations make use of MATLAB to illustrate important concepts. In addition, the book's straightforward organization -- with each chapter divided into the following sections: Objectives, Theory and Examples, Summary of Results, Solved Problems, Epilogue, Further Reading, and Exercises -- makes it an excellent tool for learning and continued reference. 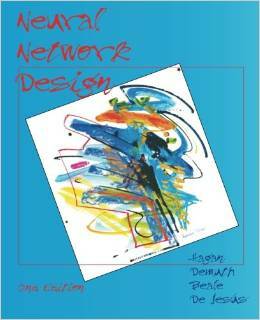 The 2nd edition contains new chapters on Generalization, Dynamic Networks, Radial Basis Networks, Practical Training Issues, as well as five new chapters on real-world case studies. In addition, a large number of new homework problems have been added to each chapter. A free 1012 page eBook version of the book (11.4 MB PDF) can be downloaded from here. A somewhat condensed 800 page paperback edition of the book can be ordered from Amazon. Video lectures for a 15 week course covering most of the textbook are available from the Oklahoma State University College of Engineering, Architecture and Technology Extension Office. Contact Kristi Wheeler, Manager, Engineering Extension, (405)744-9227.